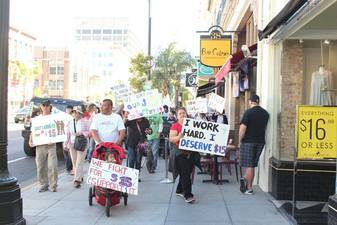 Pasadena workers and supporters are fighting for a living wage. 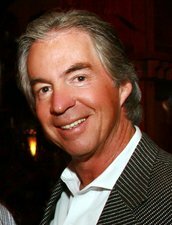 Restaurant mogul Gregg Smith (Parkway Grill, Arroyo Chop House, Smitty's and Seco) wants to stop them. Pasadena, California -- home of the annual Tournament of Roses parade and the Rose Bowl football game -- is known as the City of Roses. But a broad coalition of low-income workers, middle class professionals, clergy, nonprofit leaders, educators, unions, community and civic groups, and enlightened businesses has come together to transform Pasadena into the City of Raises. They have built a movement to urge Mayor Terry Tornek and the City Council to adopt a law raising the minimum wage gradually to $15 an hour by 2020, just as the City of Los Angeles and Los Angeles County did last summer, and other area cities (Long Beach, Santa Monica, West Hollywood, and Glendale, among them) are considering. These efforts are part of a growing national movement to improve wages and working conditions for low-wage Walmart and fast-food workers, janitors, hospital employees and others. They've been pushing cities to adopt minimum wage laws and pressuring big corporations to increase pay for its low-wage employees. In the past year, they've won significant victories. Now they are focusing on Pasadena, a city of 150,000 residents adjacent to Los Angeles. Every New Year's day, millions of Americans watch the colorful floats and marching bands of the Rose Parade on television, then settle in to view the Rose Bowl football game. But less than half a mile from where the parade route begins, near Millionaires Row, Pasadena becomes a city of low-wage workers, predominantly Latino and Black. Tens of thousands of residents struggle to meet their basic needs. Pasadena is well-known for its arts-and-crafts bungalow houses, its commitment to historic preservation, and its "smart growth" urban planning. It has a thriving downtown commercial center and is a major tourist destination. It is home to many world-class institutions, including the Art Center College of Design, the Pasadena Playhouse, the Huntington Library, the Norton Simon Museum, Fuller Theological Seminary, NASA's Jet Propulsion Lab, and the California Institute of Technology, which has fostered several major engineering and science-oriented corporations. It has an abundance of social service agencies that provide the city's many affluent residents with opportunities for philanthropy. But Pasadena is also a city plagued with enormous disparities. In fact, according to the report, "Pasadena's Tale of Two Cities" (which I wrote with Mark Maier, an economics professor at Glendale College), Pasadena is one of California's most unequal cities. Only San Francisco has a wider income gap between the wealthiest and the poorest residents. Moreover, Pasadena is rapidly gentrifying. Most of the housing developments approved by the city in the last decade have been luxury condos and expensive apartments. These are out of reach for low-income and middle class families, making it harder for working people to live here. Rents and home prices have spiraled out of sight. More than half (54 percent) of Pasadena households pay 30 percent or more of their income in rent. An astounding 28 percent of Pasadena households pay over half their incomes just to keep a roof over their head. Over the past few decades, Pasadena has invested hundreds of millions of tax dollars to improve the city's business climate and help developers, hotel owners, restaurants owners and other retailers, high tech and manufacturing corporations, and other business become more profitable. In contrast, the city has done very little to help its working families deal with the huge gap between wages and the cost of living in Pasadena. Now it is time for the city government to restore some balance to its policy agenda that has favored profits over people. Earlier this year, Pasadenans for a Living Wage (PLW) came together to spearhead a campaign to follow LA's example. They injected the issue into the mayoral race, forcing all six candidates to take a position. Five of them -- including the eventual winner, Terry Tornek, elected in April -- embraced some version of the PLW plan. Since then, PLW coalition members have met individually with the mayor and all seven City Council members. They've knocked on doors in key Council districts. They've gotten more than a thousand Pasadenans to sign petitions calling for the citywide wage hike. 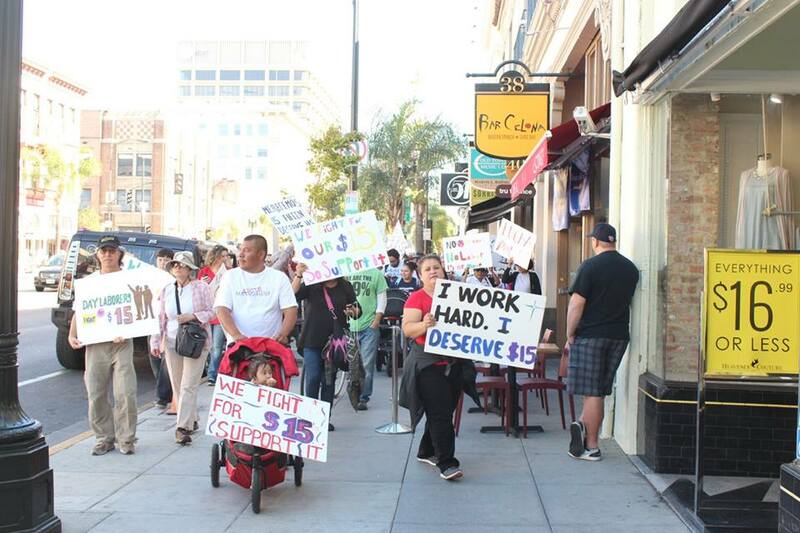 Last Saturday, they marched through old Pasadena carry signs saying "Raise the Wage" and "We Deserve $15." They've turned out large numbers of people to City Council meetings to demand that the city take action to address Pasadena's outrageous income disparity. Their efforts have paid off. A recent public opinion poll found that 74 percent of Pasadena voters support the $15-by-2020 minimum wage plan with strong enforcement and an annual cost of living increase. Large majorities in every City Council district embraced the proposal, including 77 percent in Tyron Hampton's district, 75 percent in Margaret McAustin's district, 71 percent in John Kennedy's district, 78 percent in Gene Masuda's district, 76 percent in Victor Gordo's district, 80 percent in Steve Madison's district, and 63 percent in Andy Wilson's district. As with any plan, the devil is in the details. A few City Council members claim to support the $15-by-2020 plan but talk about exempting certain nonprofit organizations. But many prominent Pasadenans think that such exemptions are a terrible idea. Last month, for example, nine leaders of Pasadena's most effective nonprofit organizations that serve low-income families -- Chanel Boutakidis (Five Acres), Rev. Dr. Donna Byrns (Friends in Deed), Akila Gibbs (Pasadena Senior Center), Jessica Kubel (YWCA), Marvin Gross (Union Station), Jaylene Moseley (Flintridge Center), Michelle White (Affordable Housing Services), Margaret Martinez, and Stella Murga -- called on the City Council to adopt the minimum wage proposal with no exemptions for nonprofits. They wrote: "There is absolutely no logic and certainly no justice in paying an office worker, or a janitor, or a youth outreach employee who works for a nonprofit organization any less than someone holding the same job working at a for-profit company or for a government agency. They have the same skills. They all have to support their families." They were joined by 20 local clergy -- Rector Ed Bacon, Pastor Nicholas M. Benson, Pastor John B. Bledsoe, Rev. Jennifer Burgos, Rev. Donna Byrns, Rev. Matthew Colwell, Pastor Mace D. Doyne, Rabbi Marvin Gross, Rev. Lissa Gundlach, Pastor Henry A. Johnson, Rev. Tera Little, Pastor Kerwin Manning, Fr. Gerard O' Brien, Rev. Sandy Olewine, Rev. Hannah Petrie, Rev. Jake H. Pomeroy, Rev. Andy Schwiebert, Rabbi Becky Silverstein, Rev. John Stewart, and Pastor George Van Alstine -- who signed a similar statement of their own. Others who have endorsed the plan include the League of Women Voters, Amalgamated Bank, the NAACP, ACT, ACLU, California Nurses Association, UNITE HERE, Democrats of the Pasadena Foothills, the Coalition for Humane Immigrant Rights of Los Angeles, United Teachers of Pasadena, the Day Labor Organizing Network, Rick Brandley (owner of George's Plumbing), newly-elected PCC board member Hoyt Hillsman, and PUSD school board members Elizabeth Pomeroy, Patrick Cahalan, and Larry Torres. Why do we need a minimum wage increase in Pasadena? •	Many Pasadenans earn low wages. Nearly one third of working Pasadena residents earn less than $15 per hour. About 15 percent of those employed in Pasadena earn less than $15 per hour. •	Families aren't making enough to get by. More than 17 percent of households in Pasadena live on less than $25,000 per year. •	Low wages are bad for the economy. When workers struggle to pay for the basics, like food and rent, they have very little to spend at other local businesses. •	Low-income children face many obstacles to doing well in school. About two-thirds of Pasadena Unified School District students live in low-income families. As PUSD school board president Elizabeth Pomeroy explained in a recent column: "Lifting families out of poverty by raising the minimum wage is a step toward putting a more stable floor under these young lives, so they can succeed in the education that PUSD is committed to giving them. And having these steadier, better-prepared students at school also benefits their classmates, so there is better progress for all." •	A higher minimum wage would create economy-boosting jobs. A $15 per hour Pasadena minimum wage would inject over $230 million per year into the economy, generate many new jobs, increase tax revenue, and reduce spending on the social safety net. Not surprisingly, the Pasadena Chamber of Commerce and some restaurant owners are lobbying the mayor and City Council to kill the plan. "Slow the process down," Chamber president Paul Little wrote in a memo to his members last week. He wants the City Council to form a committee and study the issue. And if the City Council insists on adopting a $15/hour minimum wage, Little wants it to exempt workers who earn tips. This issue has already been studied by numerous economists, several of whom have spoken at City Council hearings. In his remarks last month to the City Council, Dan Flaming -- a Pasadena resident and president of the LA Economic Roundtable, a nonprofit economic consulting firm -- made a powerful case that Pasadena is in a strong position to adopt a $15-by-2020 minimum wage without any significant harm to local businesses, including restaurants. Calling for more "study" is simply the Chamber's ploy to delay action. Little is also asking the City Council to break the law. A recent legal memo from the California Legislative Counsel Bureau made it clear that under state law, tips cannot be considered part of the minimum wage in cities that adopt minimum wage laws. Moreover, only a handful of waiters and waitresses -- those who work in the most expensive restaurants -- earn close to a living wage from their base pay and tips. In fact, because of their low wages, 48 percent of Pasadena residents who work in restaurants live in overcrowded housing and 16 percent have family incomes below the poverty threshold. Many restaurant employees -- the kitchen staff as well as the servers -- have to work two jobs and they still barely make ends meet. Leading the lobbying campaign against the plan is Gregg Smith who, along with his brother Bob, owns four upscale local eateries -- the Parkway Grill, Arroyo Chop House, Smitty's and Seco. The Arroyo Chop House charges $23 for a burger -- about two-and-a-half times the current hourly minimum wage in California. Smith has organized restaurant owners to meet with the mayor and Council members to persuade them that paying employees a living wage will destroy their industry. According to sources, Smith hosted a gathering this week of owners from Green Street, Pie & Burger, Robin's, Central Park, and other eateries to strategize about defeating the minimum wage plan. Thanks to their restaurant empire, the Smith brothers have done well for themselves. To display their success, they fancy themselves to be philanthropists by supporting Huntington Hospital (a viciously union-busting employer) and other causes. But Gregg Smith is clearly more interested in charity than justice. Justice is served when, through public policy, all people are able to help themselves and their children achieve a decent life. If the Chamber of Commerce, Smith and his restaurant buddies are able to stop the city from passing a minimum wage, they'll be taking food out of the mouths of the children of low-wage workers trapped in poverty. Let's give Smith credit -- he puts his restaurant money where his mouth is. Earlier this year, he donated $5,000 to Bill Thomson, the only candidate for mayor who opposed any minimum wage. He donated another $1,000 to mayoral candidate Don Morgan, who in a February 4 email to Smith, told him that, if elected, he'd be against the minimum wage, even though he publicly said he was for it. Smith and his friends at the Chamber of Commerce are crying wolf. Many other cities have already adopted similar laws with no negative consequences. A cover story in the October 23 Puget Sound Business Journal (Seattle's business newspaper) was headlined "Apocalypse Not: $15 and the Cuts That Never Came." Its subheading: "This is a story of the minimum wage meltdown that never happened." It reported that since Seattle adopted its minimum wage law, the number of restaurants is growing. Trying to counter the truth, Little has been circulating a so-called "study" by the American Enterprise Institute (AEI) -- a right-wing corporate-funded propaganda outfit. Asking AEI to do a "study" of the minimum wage is like asking the National Rifle Association to look into the advantages of gun control or hiring Donald Trump to examine the pros and cons of Mexican immigration. Raising the minimum wage is both an economic and a moral issue. The economics are clear: Gradually raising the minimum wage to $15 over five years will lift families out of poverty, improve the local economy, and help students overcome obstacles to success in school. On the moral question, I leave the last word to Chamber of Commerce president Paul Little. In 1997, the Pasadena City Council was debating whether to require companies that had contracts with the city to pay their employees a "living wage" of $7.25 an hour, which was significantly higher than the minimum wage at the time. Little, who was a City Council member back then, argued that "there is a moral stand to take on paying people a wage on which they can feed their family and live. Cities need to lead by example." Little may have changed his tune since then, but he was right that Pasadena needs to lead by example. There are only a few things that local governments can do to improve the lives of low-income families while simultaneously improving the local economy. Adopting a $15/hour-by-2020 minimum wage is one of them. Peter Dreier, a Pasadena resident, is chair of the Urban & Environmental Policy Department at Occidental College and co-author of Place Matters: Metropolitics for the 21st Century. A version of this article appeared in the Pasadena Weekly.